Did you know that 61% of customers read online product reviews first before making a decision to purchase? This puts into focus the importance of having customer reviews and countless ecommerce sites have proven the benefits of having them on their respective ecommerce product page. Of course, receiving online product reviews is great because you want to know if your customers are happy or not with your products. But more than their satisfaction, having great online product reviews provide far-reaching benefits, such as increased sales and better organic traffic, which we will go into detail in this article. There are many ways to get customers to start reviewing your products online and in this article, we will show you how to get more product reviews flowing in your ecommerce site as well as the benefits of having them. By emailing customers to request for a review after a purchase was made, Marks & Spencer was able to increase their customer reviews by more than 400%. Nothing can be more credible than getting product reviews from people who actually bought the product you want feedback for. To request for their good word through email is a great option and to get started, you can use a service like MailChimp’s eCommerce360 feature, specifically their Ecommerce Workflows. To enjoy Ecommerce Workflows, you need to set up eCommerce360 to track purchase activities on your site. To set that up, navigate to the ‘Setup’ step of your Campaign Builder, scroll down to the ‘Tracking’ section and check the box for eCommerce360 link tracking. To start creating your campaign, you need to build an Automation workflow on your MailChimp account. Navigate to your ‘Automation’ page and then click on ‘Create Automation Workflow’. Choose your list or the people who will receive your emails. Do this by clicking on the ‘Select a list’ drop down menu. ‘Best Customers’ sends emails to your customers based on a parameter you set, such as purchase history. Choose this workflow if you want to send them a discount coupon. ‘Purchase from Category of Products’ sends emails to customers who have purchased a product from a particular category. The email that you will send will contain products found in the same category. Of interest to post-purchase emails is the ‘Specific Product Purchase’ workflow. This sends an email to your customers requesting their feedback on the particular product they purchased. Once you have selected your Ecommerce Workflow of choice, configure its settings on the ‘Setup’ step and enter values for the following fields – Workflow name, From name, and From email address. Next, customize your trigger or the event that will prompt the post-purchase email to send. For instance, when a product is purchased (trigger), you can set your post-purchase email to send 5 days after to your customers, giving them ample time to use and experience your product before requesting for their feedback. Configure the ‘Advanced delivery settings’ to schedule your emails based on a particular day, specific time or in between two specific times. This assures you that your email will be read by your customers on the days and times they are most likely to see it. You can also add segmentation conditions where you can create your own automation rules. You can choose your own trigger criteria or target customers according to purchase or any other number of criteria specific to your business. Next, add and design your emails in the ‘Emails’ step. Click on ‘Add Email’, then ‘Design Email’ to open the Email Designer. Start entering values for the following fields – Name your email, Email subject, From name, and From email address. Select the layout you want on the Template step of the Email Designer. There are basic layouts and themes you can choose from. You can even code your own layout especially if you want your email to adhere to your existing branding guidelines. Design your campaign and once you are done, click ‘Next’. Review your entire workflow on the ‘Confirm’ step. Test your emails to see if they are properly set up. Click on the ‘Resolve’ or ‘Edit’ buttons if there are any changes you want to make to any section of the workflow. Once you are done reviewing and applying changes, click ‘Start Workflow’. Being proactive when requesting product reviews certainly has its benefits, but it is essential to know when to ask for them from your customers. You have to give your customers enough time to use the products they bought from you. Asking it too early may turn them off. On the other hand, requesting them to review products at a much later time may mean they have already forgotten about it. So, when should you ask for product reviews then? The best solution is to put the products you are selling into context. For example if you are selling facial care products, you may want to send your post-purchase email a week since your customers received their goods. This gives them ample time to use your products and see whether they are seeing improvements on their skin or not. The general rule of thumb, a post-purchase email sent out to your customers three days after they received their items is enough time for them to have test your products and have great recollection of what it has been like to use them. Bonus: Manage to keep your brand top of mind to your customers even before sending out that post-purchase email asking for their online reviews. You can do this by sending them relevant marketing messages via email. Take a cue from Dyson who did a series of four post-purchase emails to a customer who bought a vacuum cleaner from them. The first email was sent to thank the customer for purchasing and registering the vacuum cleaner’s warranty. In ten days, the second email was sent requesting for their feedback and review. The options to write it or record it as a video were provided, giving customers the liberty to choose which one works for them best. Two months after the purchase, a third email was sent, showing practical tips on how to maximize the vacuum cleaner’s features. And finally, three months since the purchase, the fourth and last email was sent, featuring the different accessories that can be bought and used with the vacuum cleaner. Did you know that personalizing emails to your customers can significantly lift your transaction rates and revenue? According to Experian Marketing Services, personalized emails have 29% higher unique open rates and 41% higher unique click rates. And interestingly, these transaction rates double when these personalized emails are triggered, which is similar to MailChimp’s implementation. So, how do you keep your post-purchase emails truly personalized? Customize the subject line. 33% of email recipients open an email based on what is on the subject line, so personalizing it will definitely work well to your end. We want to know how you feel about your recent purchase! Your feedback is important to us. Please hear us out! John, we value your feedback! Additionally, based on the same Experian study, personalized subject lines deliver 26% higher unique open rates across all industries. So go ahead and make your post-purchase email’s subject line truly unique. Use name placeholders throughout your email copy. A placeholder marks the location in an email where information pulled from a source will be displayed, helping you tailor your post-purchase email to each of your customers. Although majority of the email’s copy is generic, your customer’s name will appear in places where it is best seen to make it seem like it was personally written for them. Show the specific products purchased. It’s always a good idea to remind your customers what they bought from you in the email. Mention the product name and include product photos. In the example below from Blue Nile, an online jewelry store, you will see the personalized salutation using name placeholders and the name and photo of the products that were purchased. When sending out post-purchase emails to your customers, make sure that within the email, there is already a link that will take them directly to the reviews page of the specific item they purchased. This makes it easy even for your busy customers to leave their valuable insights on your site. You can have a ‘Review Now’ button on your email copy similar to Nordstrom’s. Although there are customers who will go out of their way to help you sell your products with elaborate online product reviews, you have to realize that there are also those who may not be so willing to do the same. In that case, make it possible for your customers to leave their opinions about your products as easy and effortless as possible. In the same Blue Nile example earlier, consider having a satisfaction scale that customers can use to rate your products. They can rate it as being poor, fair, good, very good or exceptional. It is a quick and easy way to gauge your customers’ reactions. Another example is Amazon’s star rating in their post-purchase email content. Customers can easily rate their purchased products with 1 to 5 stars. After the appropriate number of stars are selected, the customer will then be led a simple page on Amazon where the rating has been pulled in for the specific item. The same page also displays all the other recent purchases of the customer, making it even more convenient to provide star ratings for other purchases. Another easy way to get product reviews is to let your customers rate the key features of the product they bought. This can be very helpful to your other customers seeking reviews as it provides your product more context and detail. Without having to write anything, customers of Delightful Deliveries can rate their purchased product based on pre-defined features. It is up to them how many stars they will place for appearance & packaging, flavor, freshness, quality and value. Sometimes, even your happiest customers want some form of incentive to make them more inspired to go out of their way and review products. Giving out a small incentive, such as a small gift you can ship to their address or a 10% discount on their next purchase, is a great way to show your appreciation. Crate and Barrel may not directly give out an incentive, but they do give their customers a chance of winning a shop card worth $1000. The mechanics are simple to do too. Remember: When giving out incentives to your customers, you are giving them a token in exchange of writing a product review and not for creating a great one. 68% of consumers trust product reviews more when they see a mix of good and bad feedback. And interestingly, 30% of consumers suspect a fake product review if they do not see any negative opinion on the ecommerce product page. Bad product reviews are valuable, but keep in mind that it should be in a good proportion to your good reviews. For instance, if an ecommerce product page has 20 product reviews and 3 are negative, the remaining 17 reviews look trustworthy. If the proportion is reversed, you know you need to do something about your product. Negative product reviews can make your positive ones more believable, but never play with your customers’ tolerance. 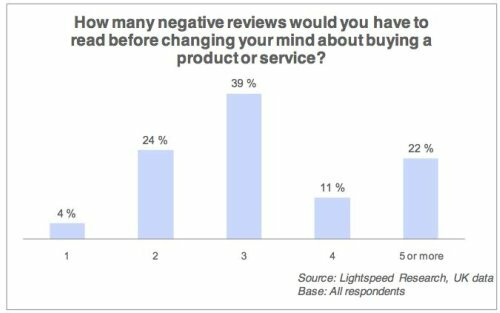 According to Lightspeed Research, between one to three negative product reviews will be enough to discourage shoppers from purchasing a product. Keep in mind the type of products you are selling and the reviews you expect to get from your customers. A book or an online game will definitely keep your customers divided in opinion, but if you are selling a technical item, like a vacuum cleaner or a camera, you need to have as less negative reviews as possible. Reevoo and Bazaarvoice are examples of ratings and review networks that you can use on your ecommerce site. These make your ecommerce product pages more persuasive for your shoppers and also a tested way to create a body of reliable product reviews for your product pages. Aside from streamlining the process for you, using these services also offers authentication. It is important to note that they do not make fake reviews. In fact, they work towards getting customers to testing products to make your reviews truly a credible source of information for your shoppers. It guarantees your other shoppers that the product reviews on your site are indeed coming from people who have purchased the product in question. Both small and large global brands use Reevoo and Bazaarvoice, including Adidas, Black + Decker, L’Oréal, and Kraft to name a few. Aside from just letting your customers help you sell your products, online reviews have great benefits to two things – your conversions and your organic traffic. 50 or more reviews per product can increase conversion rates by 4.6%. Product reviews produce an average of 18% lift in sales. 63% of customers are more likely to shop from a site which has online reviews. Ultimately, product reviews do boost conversions because it eliminates doubts a customer may feel during the purchase journey. Aside from the obvious convenience, online shopping also has downsides, such as potential customers not being able to touch or try a product first before buying it. The decision to purchase a product largely depends on the information available – product photos, descriptions, and features. Making customer reviews available on product pages vouches the utility of that particular item. It truly appeases any concerns during product selection and is an effective way to guide the shopping journey much like an ecommerce site’s FAQ page or live chat support. Aside for improving your conversions, product reviews also provide valuable SEO benefits for your ecommerce site. Product reviews are a great source of fresh, updated, and unique content for your product pages and search engines love to crawl for these things. Although it is not sound practice to use product descriptions and specs provided by manufacturers, retailers still have an edge towards organic traffic since customer reviews, a form of user generated content can differentiate an ecommerce product page from other product pages having the same content. As your product pages become more useful to your potential shoppers, whether these are for your top ecommerce products or not, you also increase your chances of ranking highly in search engine results pages (SERPs). Customer reviews also improve your rankings for ‘product name’ + review. Online reviews boost your shoppers’ confidence when purchasing items online, especially when it comes to tech items, like computers or cameras. In fact, a recent survey found that 64% actually read online product reviews before buying personal tech items. Try and search for a tech product on Google while including ‘review’ at the end. You will see a variety of keyword combinations, and if you have considerable customer reviews available on your product pages, you definitely have a great chance of appearing at SERPs. Aside from the word ‘review’, try appending related terms like ‘ratings’ to your product names to maximize your SEO benefit. Product reviews with star ratings also increases click-through rates on results pages. In SEO language, these are called rich snippets, which are still largely considered relevant factors to rank on search results. When formatted correctly, these rich snippets can significantly increase your click-through rate (CTR) by 17% according to Reevoo. Aside from increasing CTR, having rich snippets also helps draw attention to relevant search results. It adds social proof and credibility to your top ecommerce products and tells the user what is inside the link even before they click on it. To be able to show these customer reviews and ratings on search results, make sure that you have activated a rich snippet plugin on your ecommerce site. Product reviews are essential to your ecommerce success. Have a substantial number of them in your product pages and let your customers’ feedback and recommendations help you win more customers. Nothing eases a potential customer’s doubts than reading what happy and satisfied customers have to say. Request product reviews from your customers. Ask for them by sending out personalized post-purchase emails. Send it in a timely manner. Put your product into the context of your scheduling so you do not end up sending your email too soon or too early to your customers. Make it easy for your customers to send in their feedback by having a review link on the email or by presenting them a variety of options, such as star ratings aside from the traditional long reviews. Give out incentives, but make sure that these are given not in exchange for positive reviews. Just honest ones. Use a ratings and review network to make your online reviews even more persuasive, streamlined, and credible. And with the promising boost in conversions and organic traffic, there are definitely a lot to lose when you don’t have substantial product reviews available and flowing on your site.